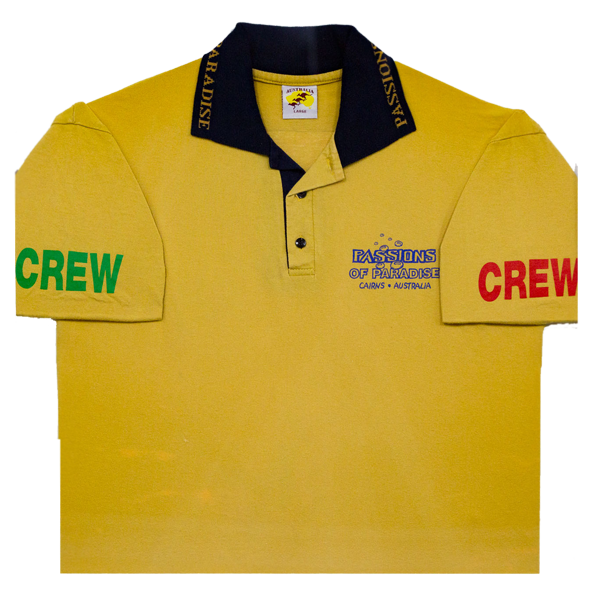 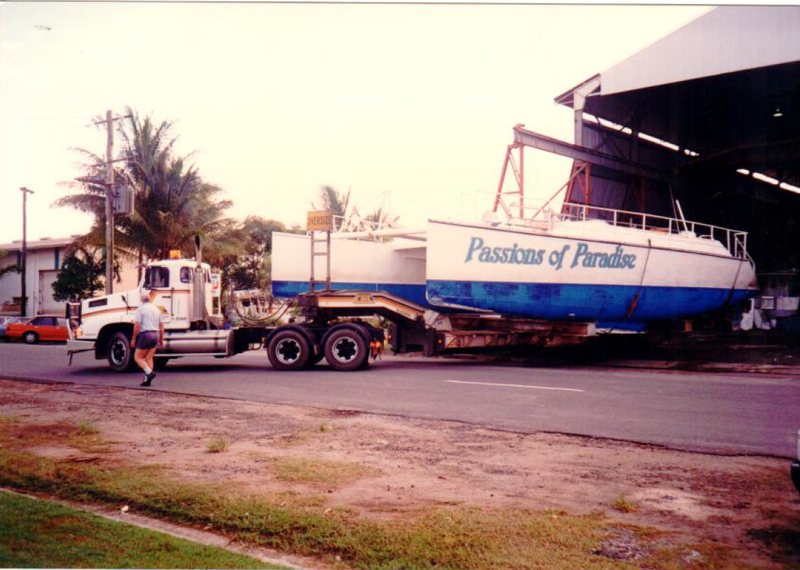 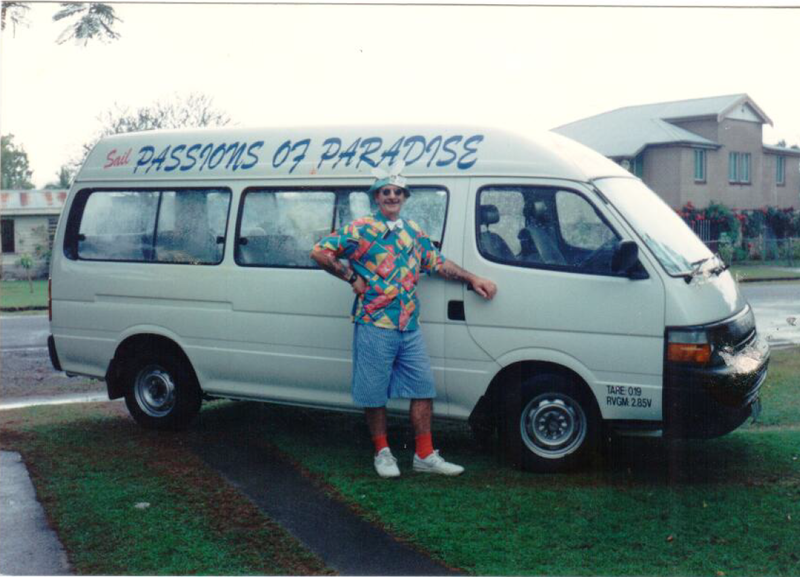 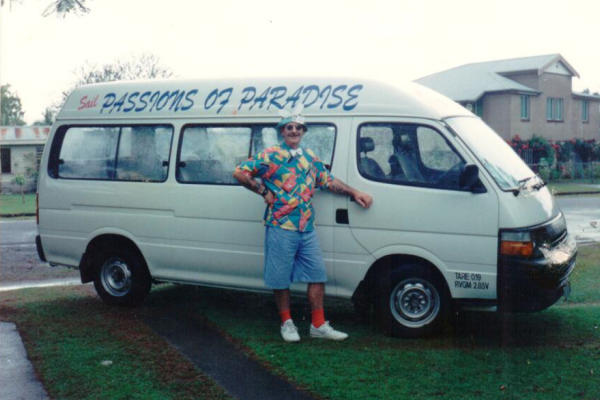 Passions of Paradise is a true local company and is one of the few in Cairns that is still owner operated. 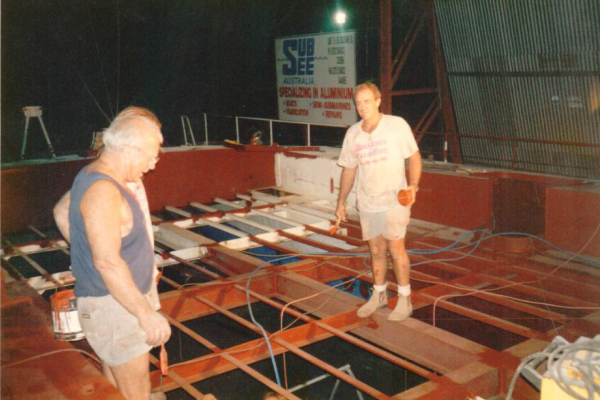 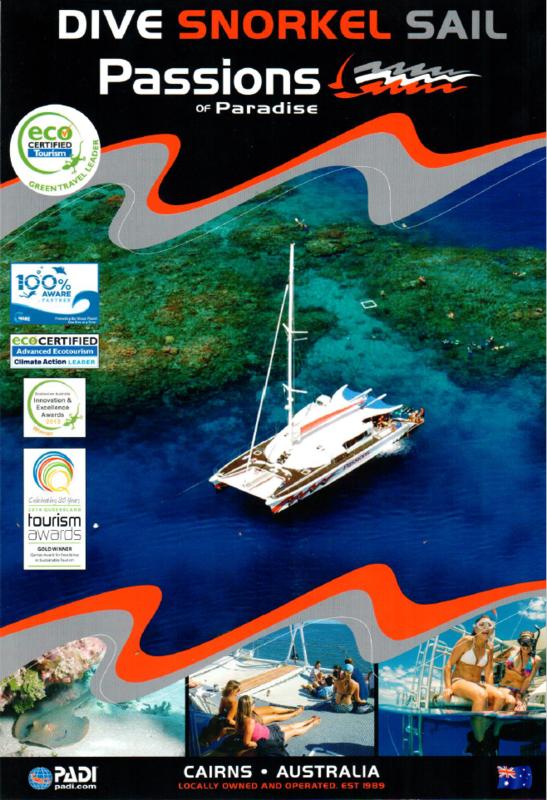 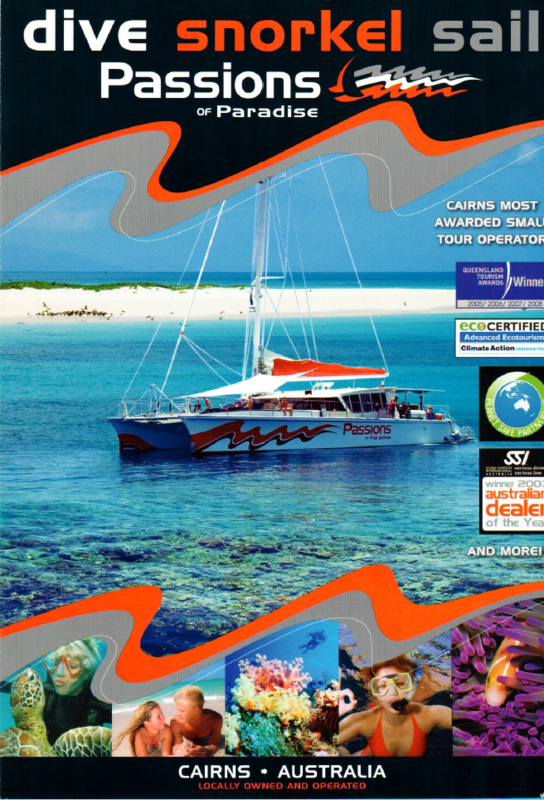 Alan Wallish built the first Passions of Paradise, a steel catamaran, in Cairns in 1987 with the simple aim of providing a fun trip to the reef. 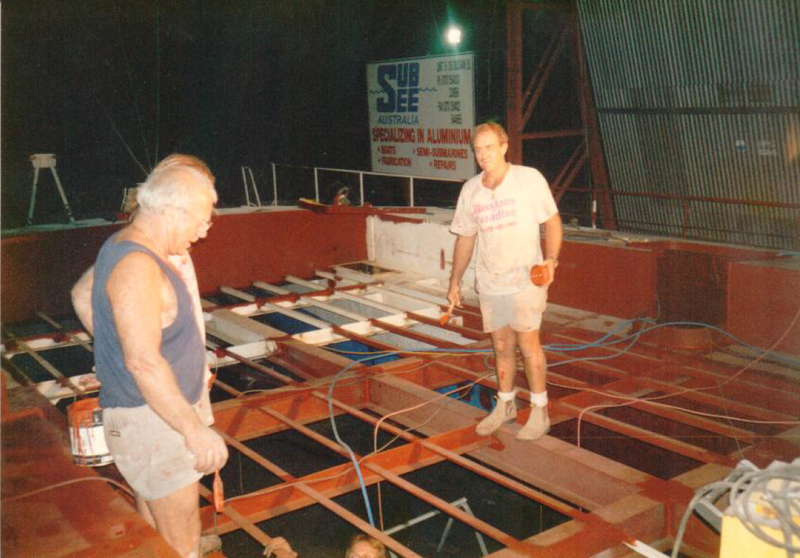 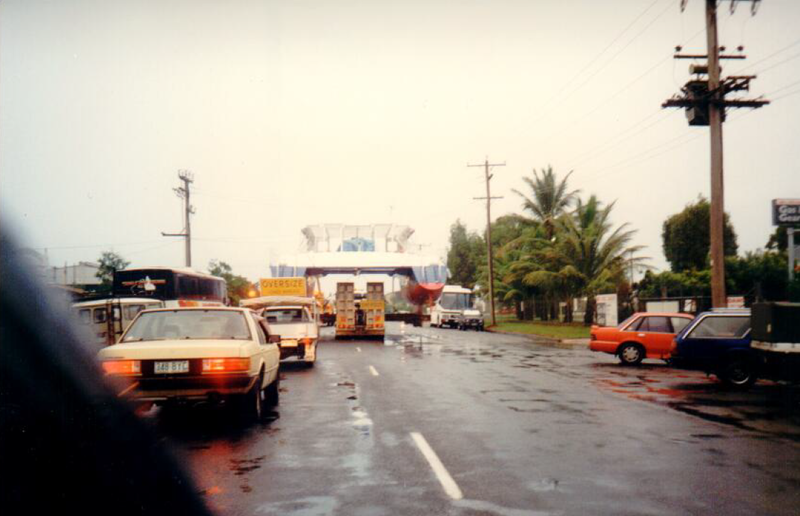 In 1997 he cut the boat in half and extended the length by 4 meters. 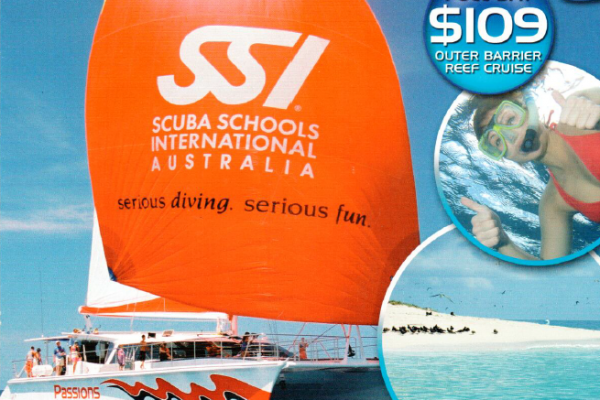 The result was a faster more comfortable ride with the added bonus of an extended range to access more reefs. Then in 2003, the “new” boat was built; Passions 2. 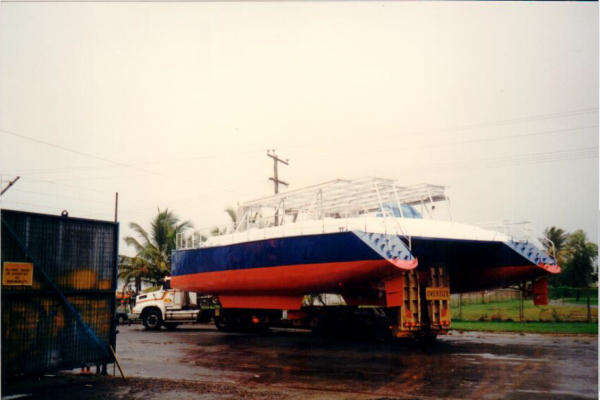 At 25 meters and made of fiber glass she was certainly built for speed and luxury. 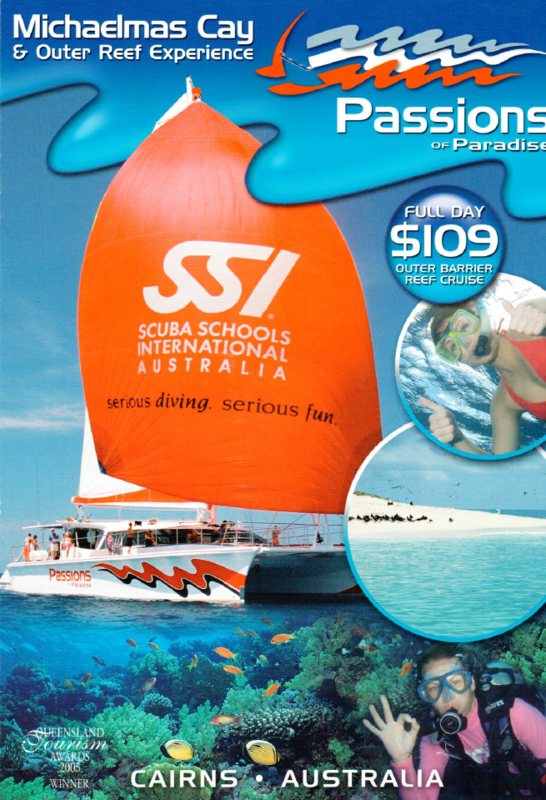 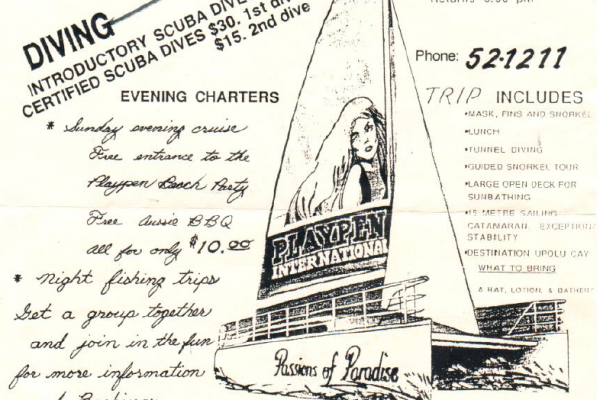 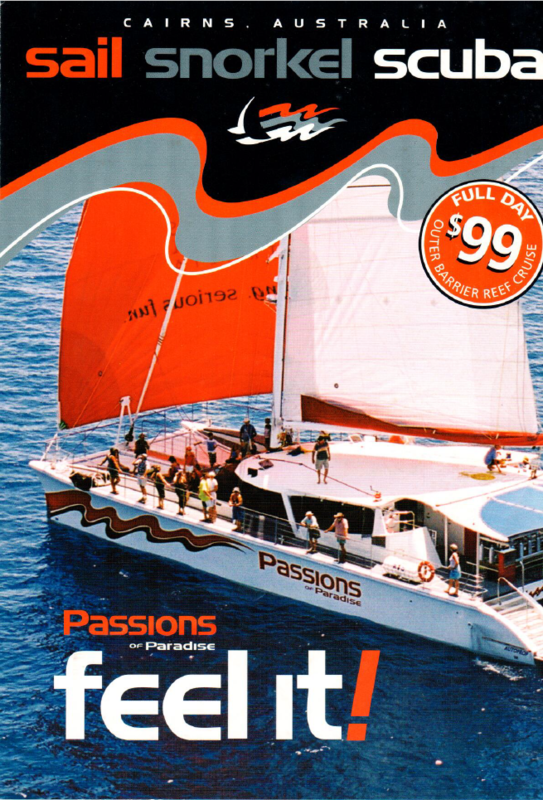 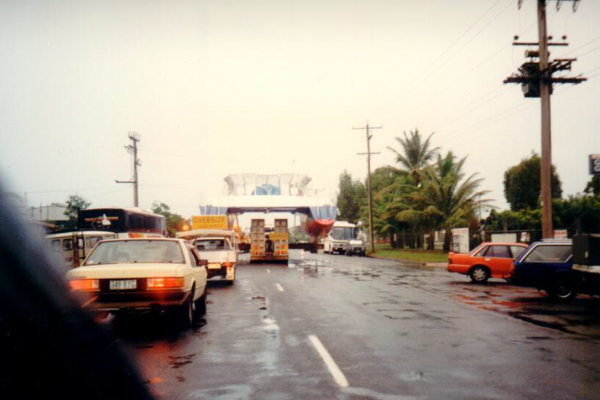 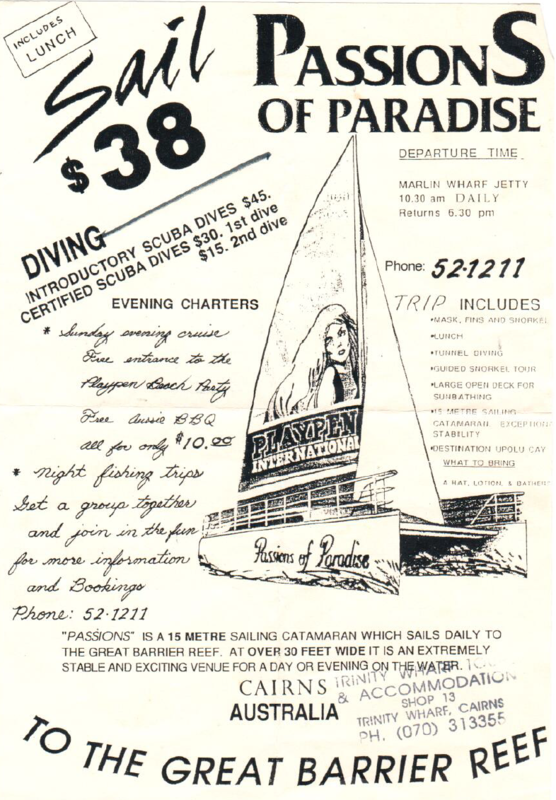 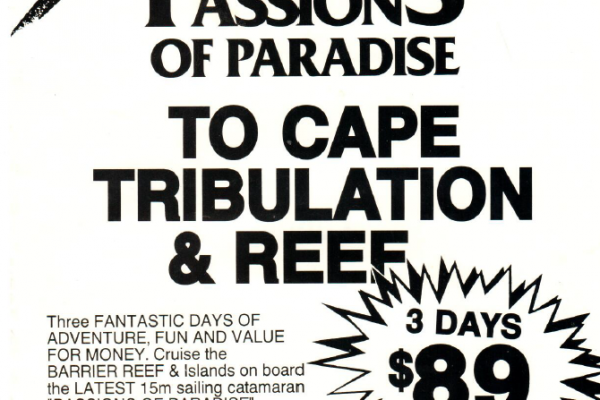 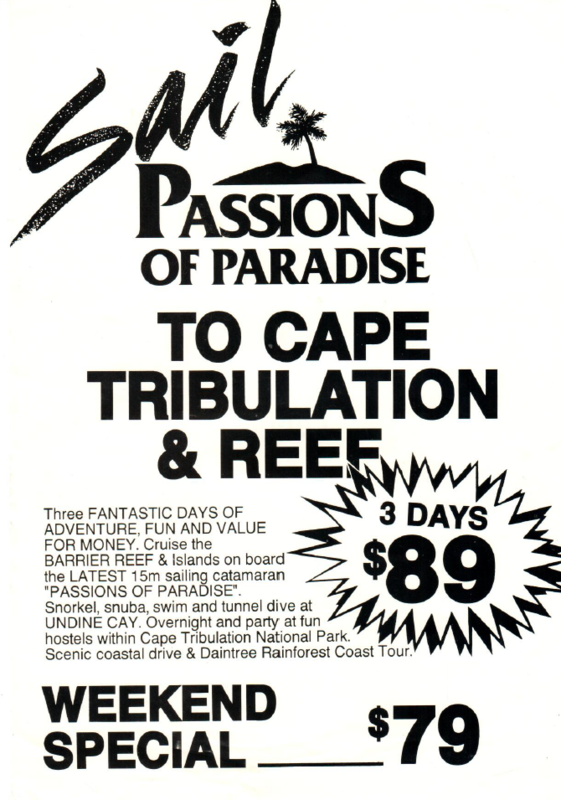 Passions 2 revolutionized day trips to the Great Barrier Reef and a provided a real alternative to travelling on a motor boat. 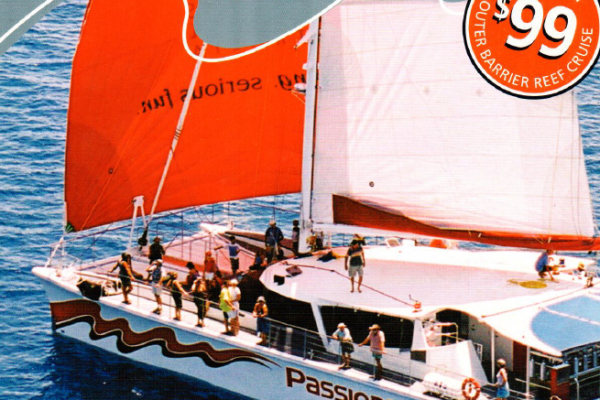 Fast forward 14 years to 2017 and with Scott Garden now joining the team, Passions III was born. 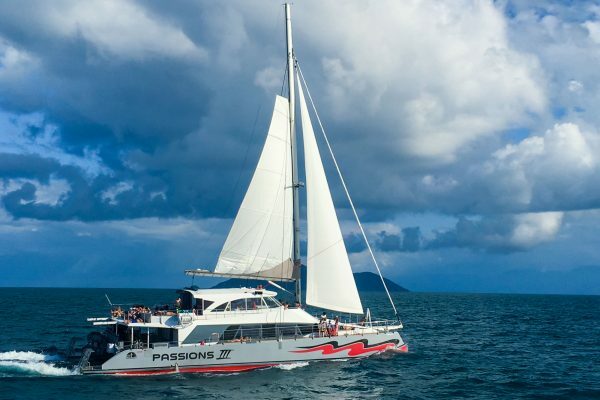 Built in a high tech composite facility in China over a three year period, Passions III at 30 meters is one of the fastest and largest sailing catamarans in Australia. 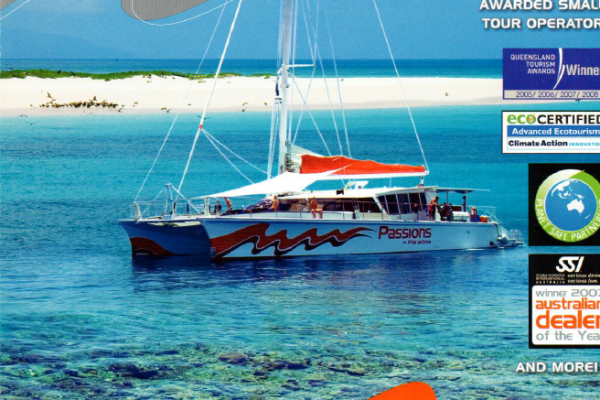 Built to travel at 14 to 15 knots, Passions III can access the furthermost outer reef locations. 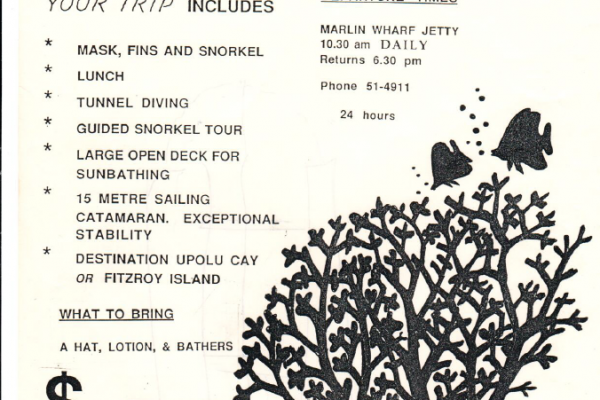 World class reefs such as Flynn, Milne and Norman can all be reached within a day trip. 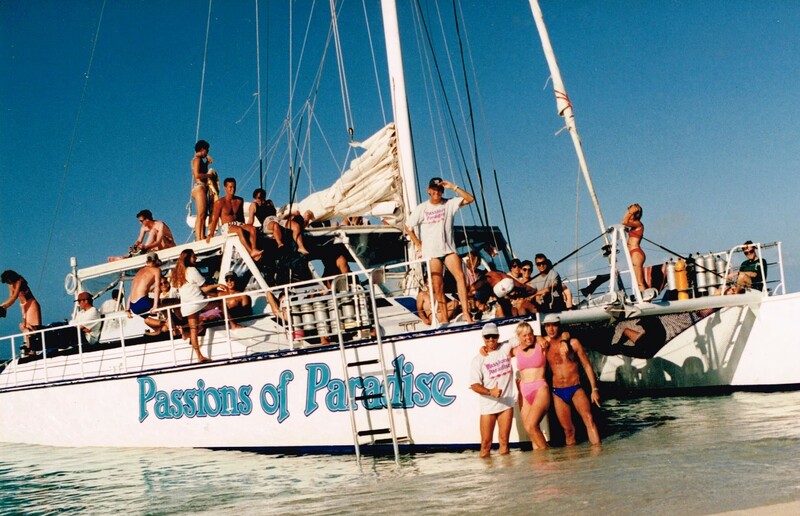 At Passions, the day starts and ends with our trip. 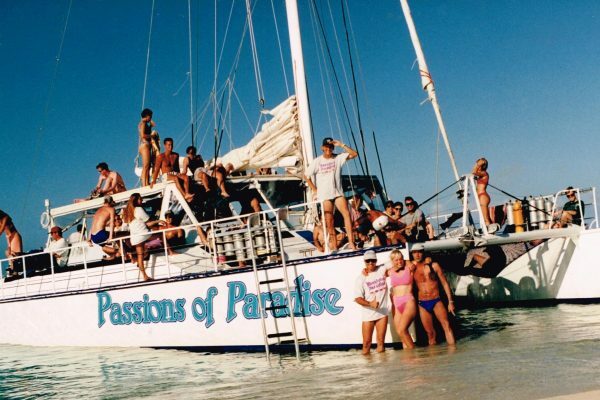 We don’t own multiple boats, we are not owned by a multi national and we don’t have a human resources department. 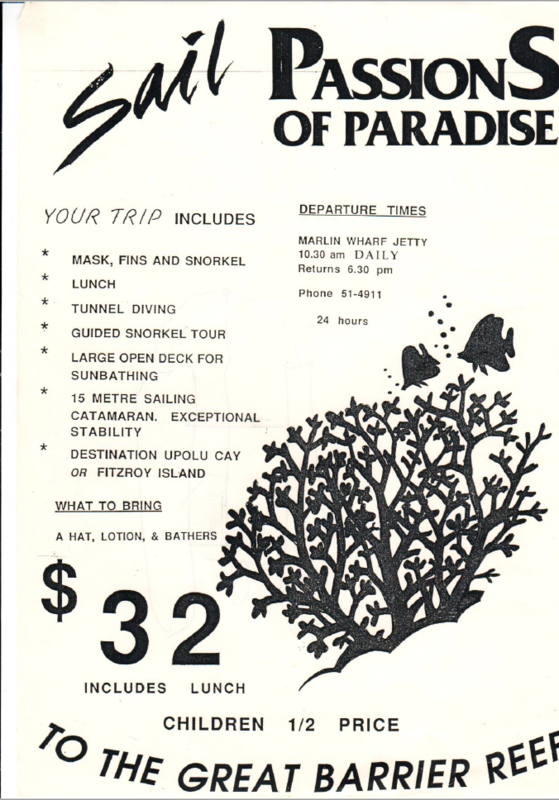 We have always been, and remain, a small dedicated operator focused on providing you with exceptional customer service and a fun day. 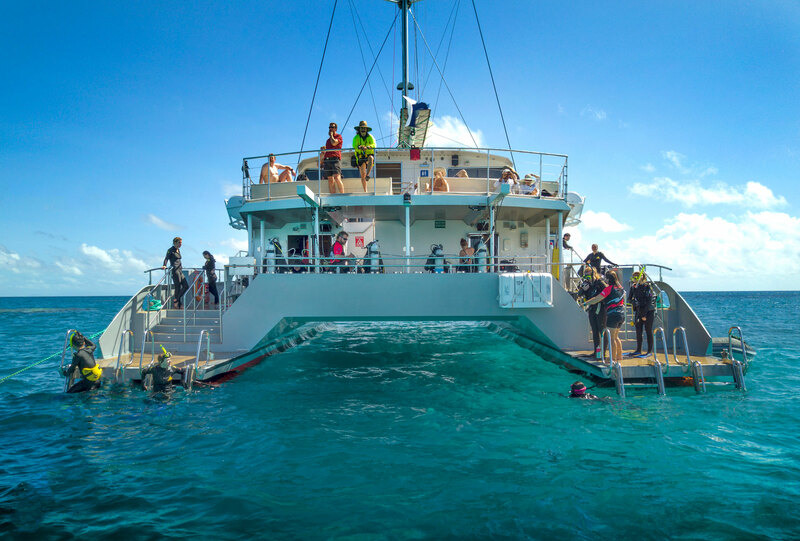 Our hand picked staff are our most valuable resource and they work hard to ensure that your day on the Great Barrier Reef is a special part of your holiday. 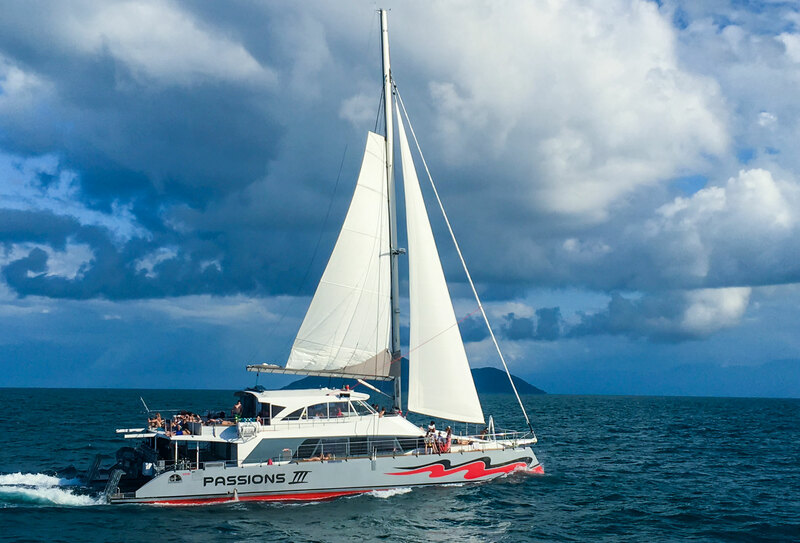 Passions III was custom designed to the exacting standards of Sydney Naval Architect Graham Parker, and built in 2017 at SZM China in their high tech composite factory. 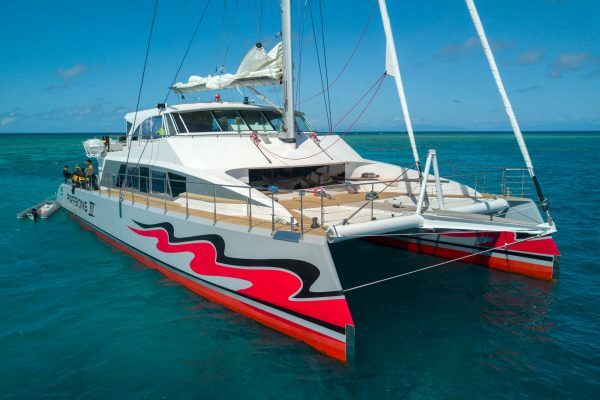 At 30 meters she is one of the largest, most comfortable commercial sailing catamarans in Australia. The brief was to build a solid, fast and comfortable all weather sailing catamaran with a shallow draft to take advantage of the reefs at our unique outer reef locations. 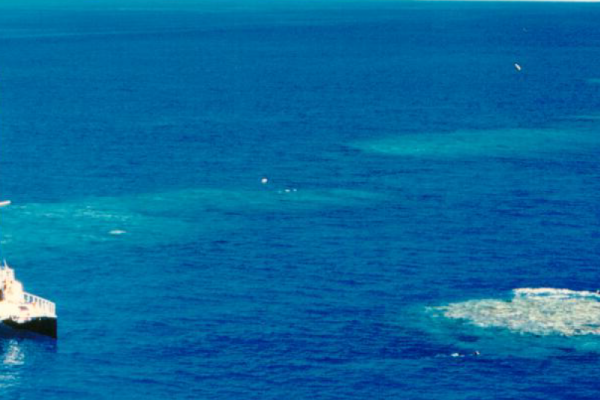 A fast passage means more time on the reef. 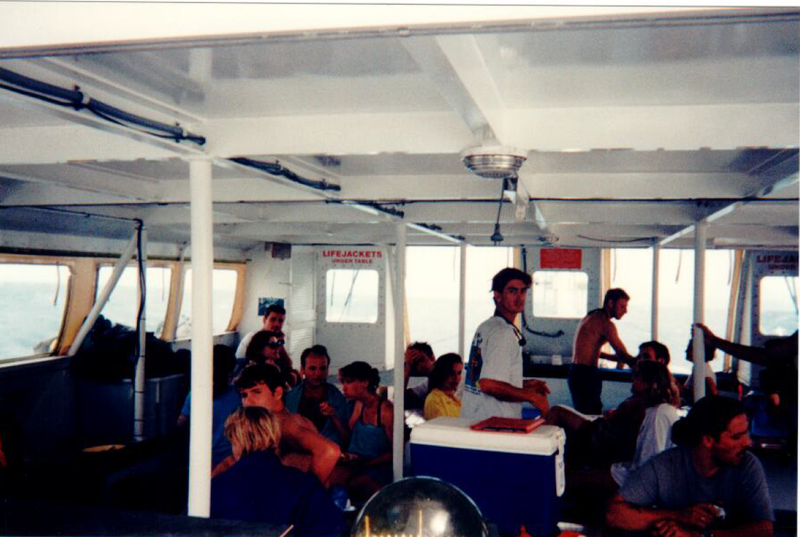 Seating is designed so that all passengers have a clear view out of the saloon. 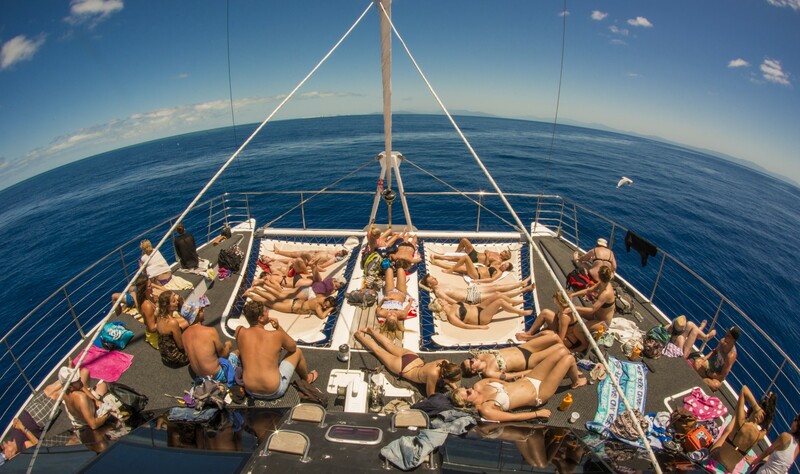 Large nets at the bow and top rear deck invite sun worshipping. 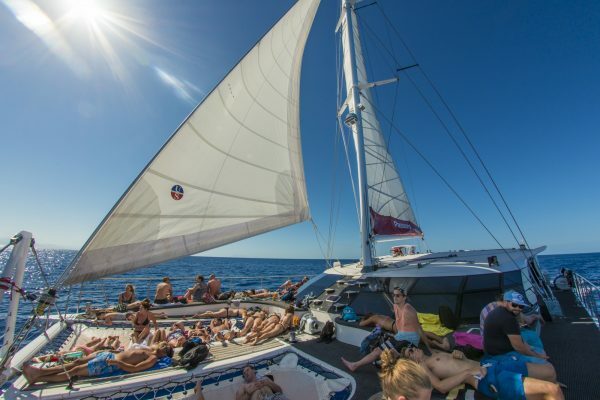 A flat carefully designed wrap-around deck means no obstacles to trip up unwary passengers. 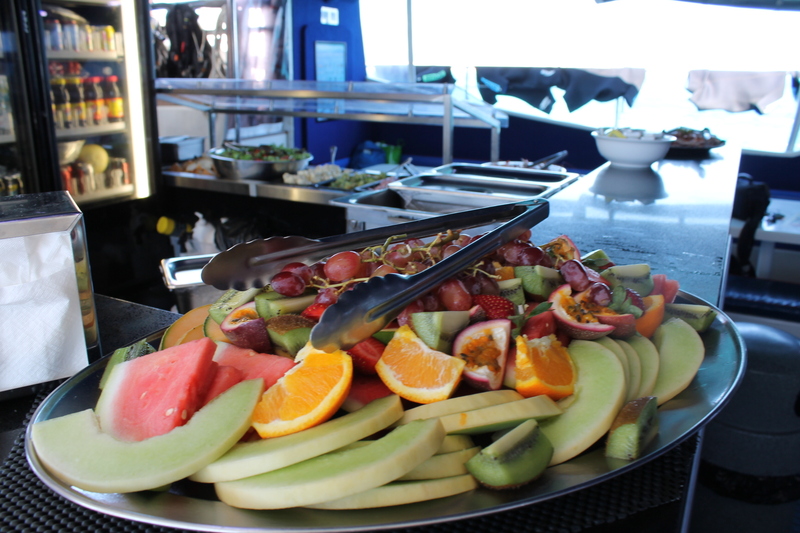 The boat boasts a fully stocked bar and commercial galley. 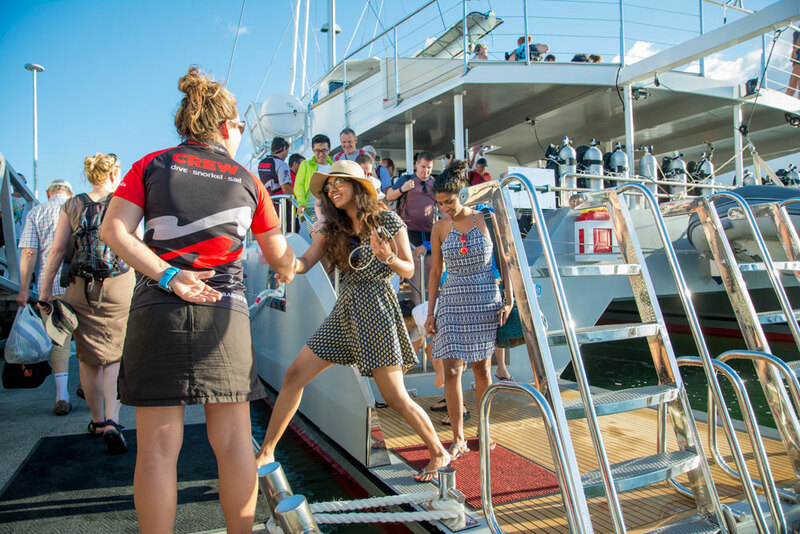 Entrance in and out of the water is simple and easy through the double rear steps on the stern. 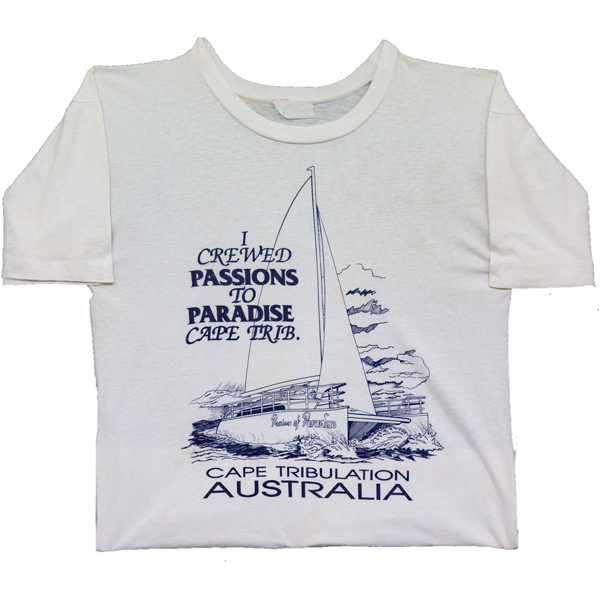 Custom designed by Grahame Parker, Sydney naval Architect. Custom rig by David Lambourne in Brisbane and sails by John Fisher of Cairns. 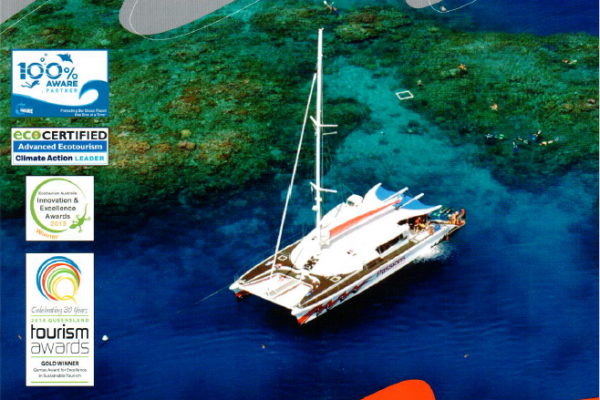 Three large toilets, comprising normal household flush toilets, electric hand dryers and fresh water. 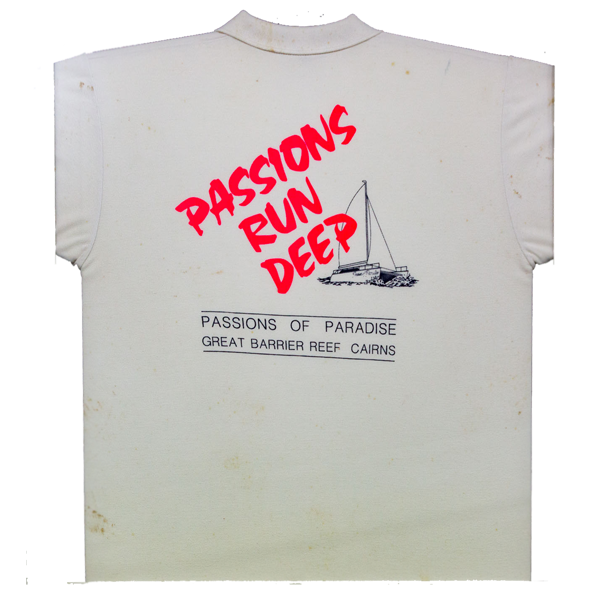 Change rooms to change your clothing. 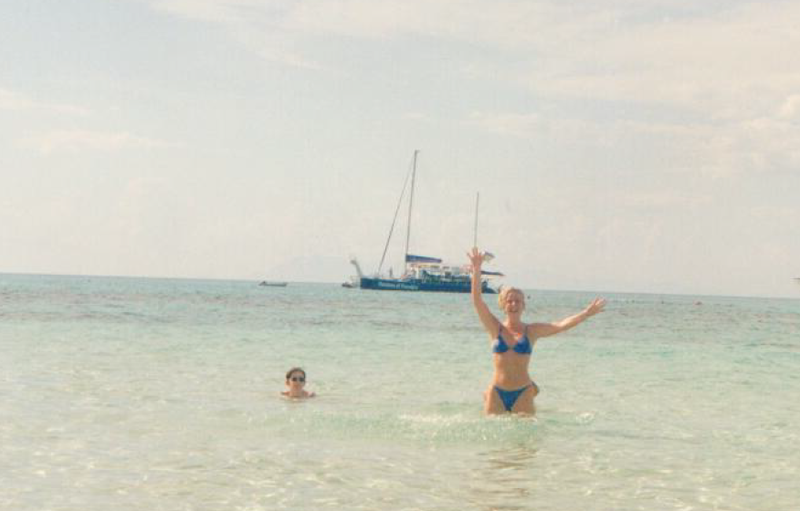 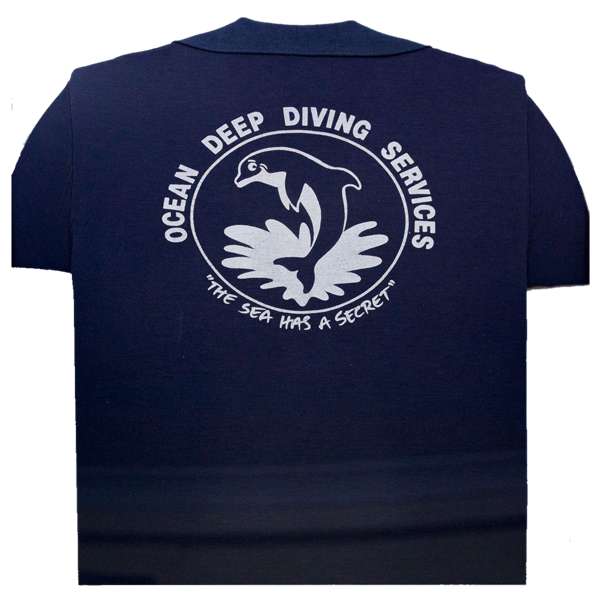 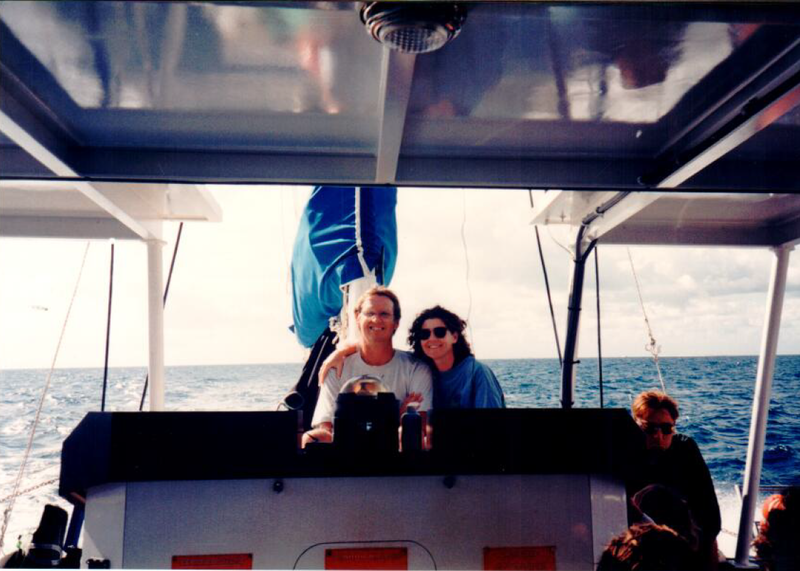 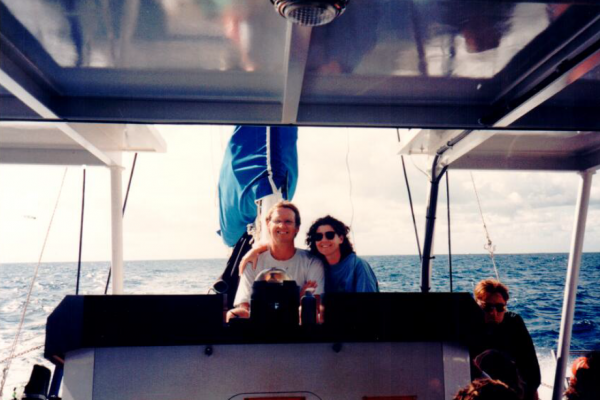 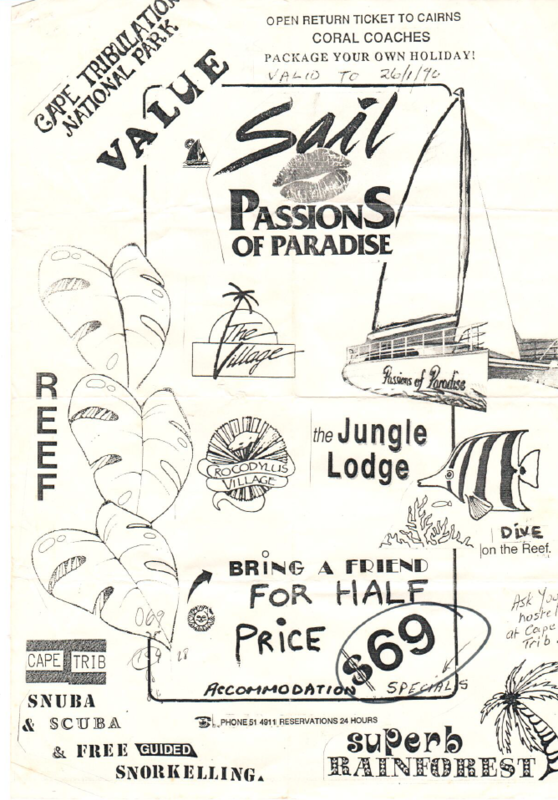 We’ve been sharing our passion for the Great Barrier Reef for over 30 years. The vessel has changed, the bikini styles, and overuse of budgy smugglers have changed and the crew have aged a little but, we’ve always had the same values and passion. 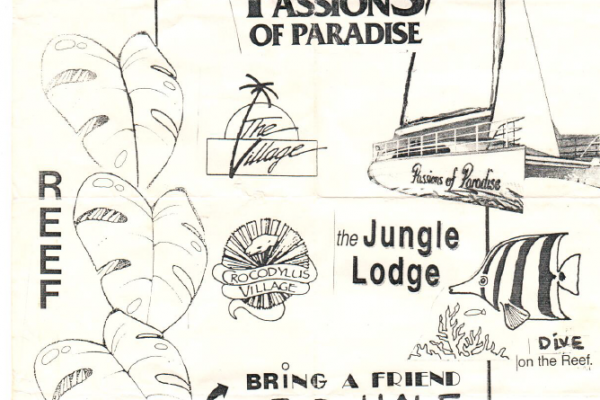 Check out our nostalgic gallery below from our first ever brochure to the first uniform!